turboTools has been an expanding project I've been working on for the past couple months off and on, mainly to reduce stress with the current max toolset, and increase my productivity speed and accuracy. turboTools is meant mainly for two things. To speed up the users workflow, and to make working with Max easier for beginners and advanced users alike. turboTools spots many differen't types of tools/scripts to make UV selections faster/easier, aligning/welding many verts faster, view multiple bitmaps of a texture at once with properies, and so on. - Fixed issues with Installer not copying over icons properly, causing the Toolbar to not load. - Fixed issues with the Toolbox tool, so now it works with Max 2013, as well as having other imrpovements and backwards capability. - Fixed up some issues with the ShrinkWrap tool, and added a Border Constraint option. Submitted by ahackel on Mon, 2013-12-09 08:09. - the scripts do not work if the User specified a custom scripts folder. You need to use 'getDir #UserScripts' to get the correct path. I would appreciate if you found the time to fix this. Submitted by Kallinski on Sat, 2013-04-20 13:25. I set the permissions right but I could not install this tools the direct way. So I extracted the turboTools_V2_Max2012_64Bit.mzp to my scripts folder an ran the install.ms manual over MaxScript. Submitted by mLichy on Sat, 2012-10-27 09:11. I've updated the downloads for Max 2012-2013 64bit right now. Give those a shot and let me know if you have any issues. I will update the others and my webpage in a bit. Submitted by PolyBend on Sun, 2012-10-21 13:17. When I attempt to install the script to 2013 x64 I get an error every time I click the TurboTools button on the toolbar. -Runtime error: Can't load Button images: bitmap: "turboMain_24i.bmp"
The icon is not even showing up. This works fine on 2012, but since I was required to move to 2013, not having these tools is killing me. Any idea what is causing this issue. I even attempted to look for that file in my 2012 install to manually install it, but no luck. Submitted by mLichy on Thu, 2012-10-04 06:26. Yes, this is a 2013 change they made. Are you talking about Secondary Isolate? I have fixed the installer for 2013 locally I believe. I just need to update the zip files and this page. Right now there is no way to dock the bar on max load. I could possibly add that feature though. I might have an update posted this weekend. Submitted by cptSwing on Wed, 2012-10-03 13:43.
after trying to add an object, I get a dotNet error message "Runtime error: No such macro-script: Isolate_Selection" .. I presume this is because Autodesk changed the way selection isolation works in '13? Submitted by wdw89 on Sun, 2012-09-02 03:05. Thank you for this useful tool and keep it free. Can you update for max 2013? When I installed the 2012 version in max 2013, it didn't show anything. I have to install it manually. And if I dock the panel, after using a function, most icons will disappear. Submitted by kyle108 on Tue, 2012-07-17 09:06.
nm got it to work, but is there a way to permanently dock the toolbar so it loads on startup? Submitted by kyle108 on Mon, 2012-07-16 13:52. Submitted by mLichy on Mon, 2011-11-07 10:16. 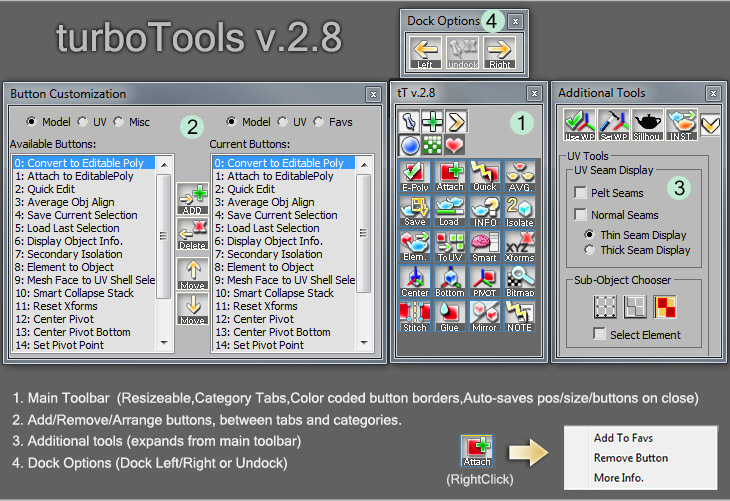 I've Updated my downloads on my site for Turbotools. I found that the .MZP install had some missing code that should have been there, and I also changed how the files are initially extracted so now it should hopefully install/uninstall without any issues.